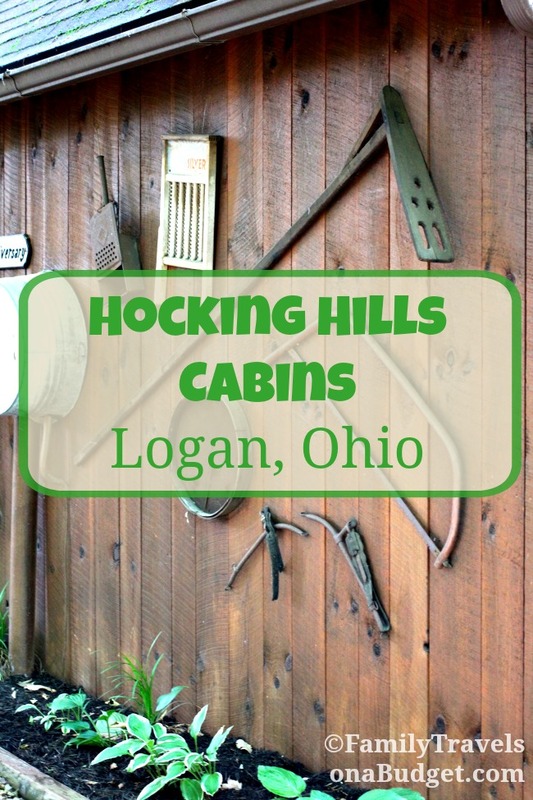 One of the first stops on my Great Ohio Road Trip was a stay at Hocking Hills Cabins in the cozy town of Logan. At Hocking Hills Cabins, best suited for a romantic escape, guests enjoy secluded lodging in charming cabins nestled in among the hills. Take a walk along the property’s many trails to enjoy abundant wildlife, beautiful foliage and wildflowers. Relax on the porch swing or slip into the hot tub and watch the sunset’s glorious display. Seriously, this is a great place for a romantic getaway! Since my husband couldn’t join me, I invited a long-time girlfriend to come along. We hadn’t seen each other in about 20 years but she lives near Hocking Hills — so our cozy cabin was the perfect place to reconnect. Besides talking late into the night (can you imagine cramming 20 years into one night??? ), we enjoyed all the cabin and its surroundings made possible. Almost immediately after arrival, the sky broke free and rain came down in buckets! That’s quite typical in Ohio, and doesn’t tend to last long. The rain gave us a chance to unpack and talk (lots of talking…). We brought burgers, veggies and all the fixins for s’mores. When the rain stopped, we headed outside to the charcoal grill and got in touch with our inner Bobby Flay! After dinner, “we made fire!” Yep! Two chicks, no men. We got our own fire going using the charcoal grill briquettes and some crumpled paper. We were quite proud of ourselves. As we should be! 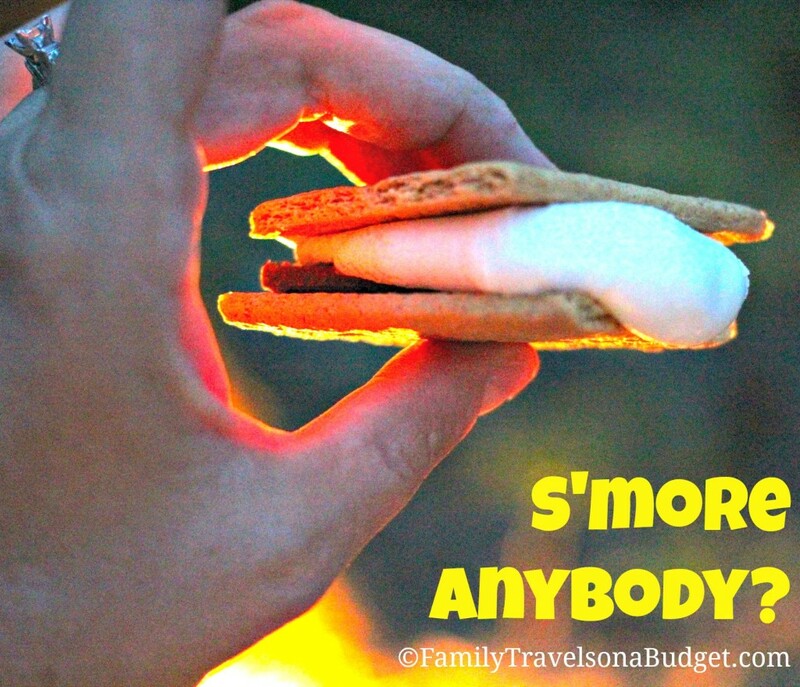 Of course, we cooked marshmallows and made s’mores…. and actually practiced a little restraint, only eating two! Look at that red ember! 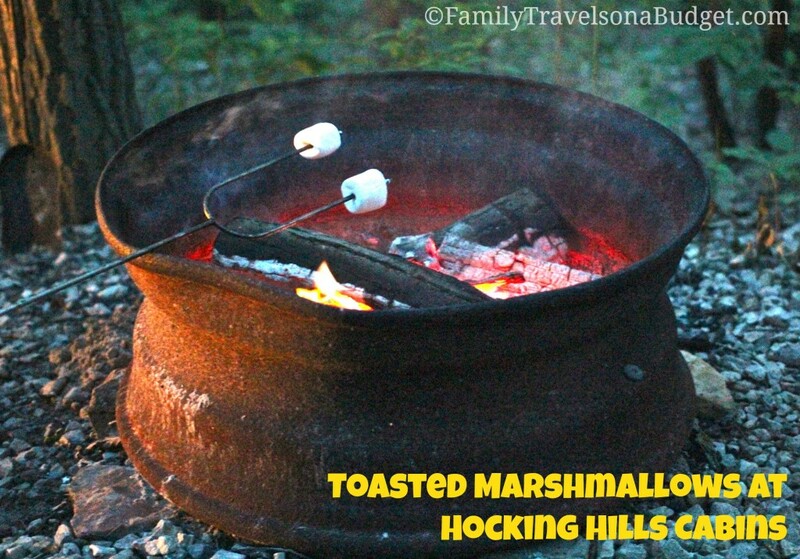 Perfect toasting fire! My backlit s’more — that’s the sunset peeking through my hand. See, the rain doesn’t last long! After dinner, the rain returned. So, we headed to the swing on the covered porch to continue our visit…. but it got heavy enough we retreated indoors to the comfy sofa instead. I’m sure you’d love to hear what two women of teens who haven’t seen each other in 20 years talk about, but instead….. let me tell you about the cabin! We stayed in “Anniversary” which is a small A-frame cabin. The first floor, open concept space includes a sitting area with fireplace (you can’t use the fireplace during the summer months), dining table and kitchen. Tucked away in the corner is the full bathroom that looks brand new! A circular staircase leads up to the sleeping loft which has a queen size bed and sloping roof. The whole cabin was spotless and well-appointed. It had a sense of airiness and coziness all in one, probably because of the vaulted ceiling. Very charming indeed. 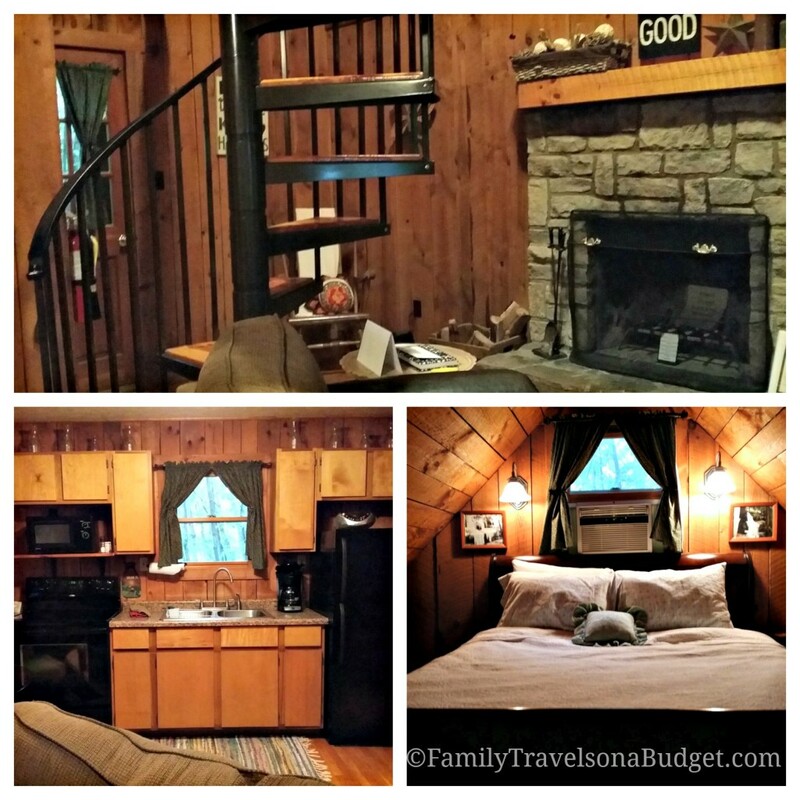 While I enjoyed the privacy of our cabin in the woods, the interior cleanliness surprised me the most! When I hear “rustic,” I tend to think drafty, rough-hewn, and not modern. This cabin was quite the opposite. We enjoyed the comfy sofa, charming decor, cleanliness — and the fact that giant spiders didn’t consider us roommates! We enjoyed our stay immensely. Hocking Hills Cabins are close to Route 33 and all the outdoor recreation in the Hocking Hills region, making it a great place to escape the city’s hustle and bustle. I would love to return here with my husband one day — maybe next year for our 25th anniversary! I don’t know that I’d bring my family here, though. Hocking Hills Cabins offers larger family cabins, but the property is geared toward romantic getaways and adult trips, particularly the indulgences add-ons — such as dinner prepared by a private chef — and spa treatments. Adventure packages might be a good money saver for traveling families, though. No GPS! Cell phone reception throughout the Hocking Hills is quite limited. Print directions before you go or you might get lost! (I’ve got a story on that — but I’ll save it for another day!) Barb sent directions a couple days before my trip. Excellent service there! Bring your own beach towels. A sign on the bathroom towels says not to use them for the hot tub, so bring your own! Or drip dry. Your choice! Bring all you need for kitchen and bath (other than dishes and towels). Unlike many hotels, Hocking Hills Cabins does not regularly stock the kitchen with coffee, creamer, and sugar. There is a coffee maker in the unit, but you need your own supplies to brew it. We forgot our coffee — bummer! In the bathroom, hand soap and towels are provided, but bring your own shampoo and lotions. Families with young kids. Our unit was not childproofed, though I don’t think a rustic cabin built on a hillside is easy to childproof! Make sure you look at photos before going if this is a concern for you. 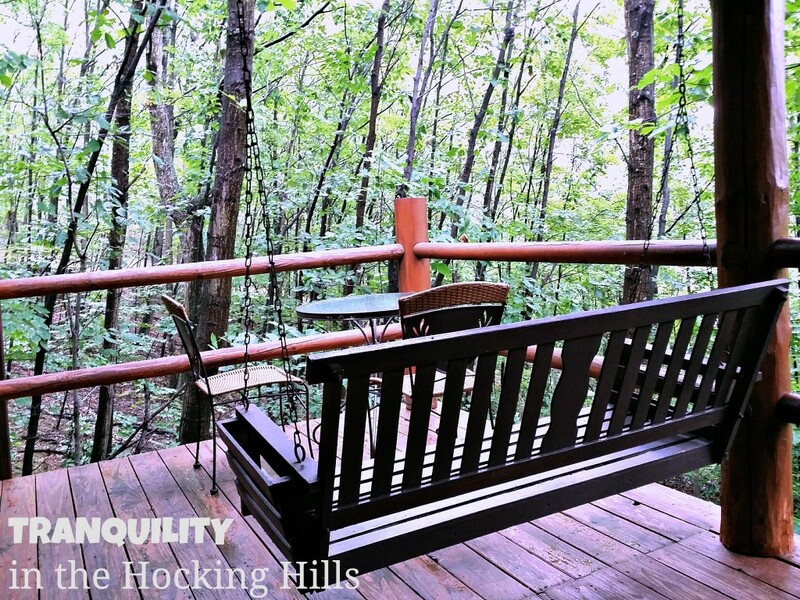 • Visit Hocking Hills Cabins online for rate information, specials (like a Zip Lining Package), and availability. Barb suggests booking three weeks ahead to get your pick of cabins, and 3-6 months ahead for October (when the leaves are at their most colorful). • This region is quite expansive. To find cabins in other areas visit the Hocking Hills Official Website for a complete list of cabin rentals, some for groups of 20+. • To learn about attractions and activities in the Hocking Hills, visit the Hocking Hills State Park Travel Guide. • Visit the Hocking Hills Tourism site for great deals and even more information on the region. I would like to thank Steve and Barb Saving, my gracious hosts, and Experience Columbus for our complimentary getaway. Though I did receive a free visit, all opinions are my own. Looks like a place i would like to goto.. the cabin looks so comfortable. That cabin looks very cozy. Love that swing on the porch. Reminds me of the one we had in our old home. What a beautiful cabin that is. It looks so inviting–especially that porch-at least to me. I could see me sitting on that porch and just daydreaming the evening or morning away! It seems like the perfect getaway. Looks beautiful! What a great getaway. OMG- this looks fantastic! I wish I live closer to Ohio and that lovely place. Looks and sounds like an amazing time there. I would love to go on a vacation there for sure. Thanks for sharing. I have never heard of Hocking Hills Cabins before.